Under Notice of Violation issued by the Texas Commission on Environmental Quality (TCEQ), due to ex-employee “whistle blowing”, sufficient evidence was found that not only had a material volume of asbestos waste/debris been buried at this industrial property, but hundreds of barrels of industrial coatings and paints had also been disposed of (by burial) across a non-specified area of this 75+ acre commercial barge cleaning facility, which is positioned along the busy Houston Ship Channel. As a complicating factor, more than 9,000 cubic yards of non-characterized “dredge spoil” had also been land applied across various (unspecified) portions of the property to raise the Site along the waterfront. With TGE’s full complement of services available, preliminary historical review of the site was performed, geophysical screening used, and exploratory trenching executed to identify the approximate limits of waste disposal. Prior to actual waste disturbance, in consideration of job hazards, TGE prepared various worker protection plans, air monitoring work scopes, considered the need for stormwater controls, dust suppression contingencies, and HASP planning. Relying heavily upon employee interview, historical information and topographic knowledge of the area relative to surrounding grade (via aerial photographs and historical elevation records), TGE excavated multiple trenches across the most probable zones of burial. 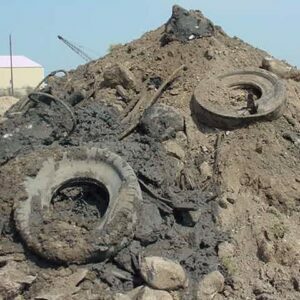 TGE also devised methods to stage and sort the waste prior to characterization, profiling and ultimate disposal off-property. While much of the associated soil was RCRA-metals-laden and impacted with semi-volatile coonhounds (dredge material), TGE’s research was effective in utilizing “process knowledge” respecting the paint-related waste to expedite TCEQ concurrence and close the case. TGE achieved clean closure of this industrial case (“No Further Action”) without the need for deed recordation or restricted use of the site.